Cook butterstick until al dente. Adding salt will help the squash release water. My culinary creativity and thrift skills were put to the test Sunday. I faced a near-empty fridge. 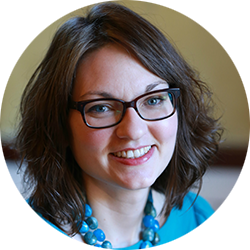 I had just returned from a weekend getaway; my vacation hangover was waxing. And I had only a few hours before I went to work. These conditions normally are not conducive to puttering around the kitchen. But necessity is the mother of invention, and I whipped up a fine summer side with what I had on hand: butterstick squash, of course! 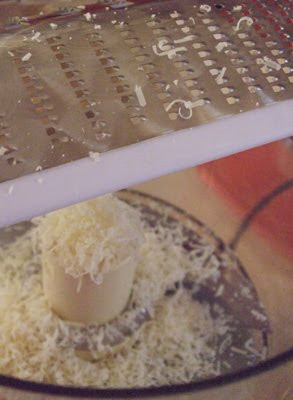 Parm is grated into the food processor bowl. I used my Oxo mandoline to slice the squash very thin. It made this task a breeze. Thicker squash will take longer to cook. If you use a knife instead of a gadget, take your time to make delicate slices. I think the pesto could be improved by including some toasted nuts — pine nuts, almonds, or walnuts. Their roasty flavor would be a nice counterpoint to the watery crispness of the squash. 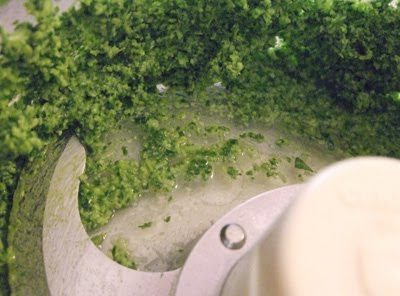 The herbs, cheese, squash liquid, and olive oil take a spin in the food processor. Heat olive oil in a 12-inch pan over medium heat until it shimmers. Add summer squash, salt, and a few cranks of the pepper grinder. 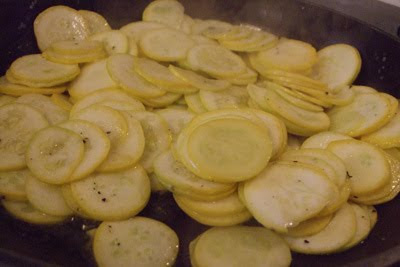 Give the squash a stir to coat slices with oil, salt, and pepper. Cook for 3-5 minutes, until squash is just past crisp tender, but not mushy and most definitely not brown. It will release some moisture. The goal is squash that’s not raw tasting, you dig? Add garlic in the last minute or two of cooking. Again, you want garlic that’s just crossed the threshold to cooked and not raw tasting. Give the garlic a nice stir into the squash. Remove the pan from heat; don’t forget to turn off the burner. 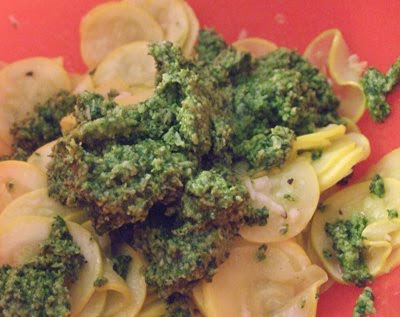 While the squash is cooling slightly, make the pesto. Finely grate the Parm into the food processor bowl. The processor should be fitted with a chopping blade. Add the parsley and basil leaves. 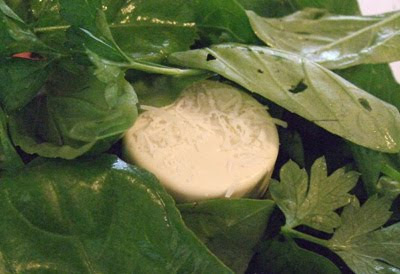 Give the blade two or three one-second blasts to start combining the cheese and herbs. 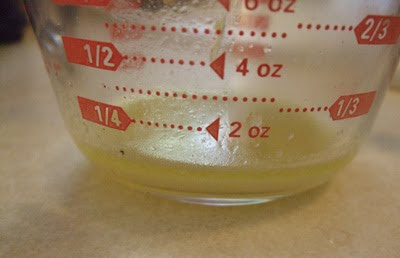 Liquid from the cooked squash is added to the pesto. Add the pesto in increments if you’re worried that it will overpower the squash. 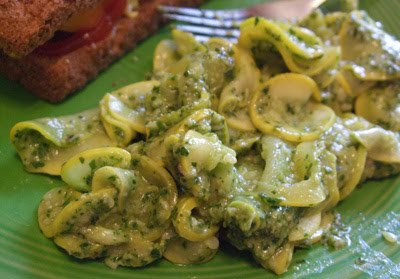 Place the squash in a bowl, and pour the pesto over the squash. Give the squash a few good tosses to coat it with pesto. I think this side tastes best at room temperature (warm, but not refrigerator cold). Makes four side dishes. I think this dish would be capital as a pasta topping. I see the thin slices mixing well with rippling egg noodles or broken lasagna noodles. Think al dente pasta with al dente squash. A light and garlicky summer side.